Slightly more rice that will fit in the jar - Basmati seems to work best. Put the knife into the jar and wiggle it gently for a while, then take the knife out, push it in again jiggle it some more. You will have to keep topping up the jar with rice, and it will take a few minutes. At some point you will find something strange happens when you take the knife out. As you jiggle the knife you will notice that the level of the rice drops, and it slowly gets harder to move the knife. Eventually when you try and take the knife out it stays stuck in the jar. 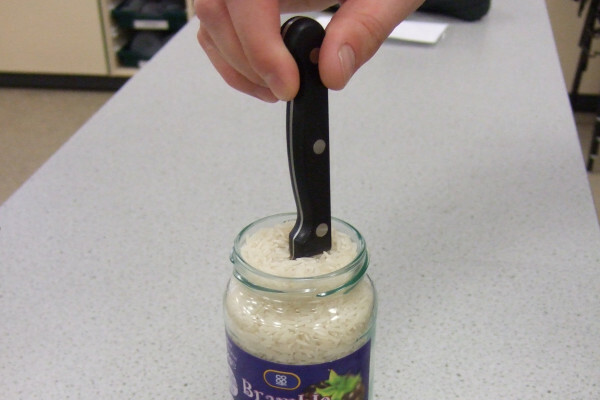 When you pour rice into the jar the rice grains will be disorganised, so when you put the knife into the rice there is space for the grains to move out of the way with very little pressure. The rice grains are not well organised so there is plenty of space between the grains. This means that when you put the knife into the rice there is space for the grains to move out of the way. When you shake the grains gently with the knife the grains fall down into the gaps between the other grains filling up most of the spaces. If you look closely in the jar you will notice that the grains tend to line up, this is because they take up less space this way. The better packed grains mean that you have to add more rice to fill the jar (pink grains) There is no longer any space for the grains to rearrange themselves, so the only way they can make space is to distort and break. Because there is very little space for the grains to move into when you push the knife into them, they have to bend and distort to allow the knife to get in - in the same way that a piece of wood would have distort when you stuck a knife into it. Distorting rice grains takes a lot of force, and the rice is slightly elastic so it will push back and grip the knife, allowing you to pick up the jar without touching it. What has this got to do with holes in the road? When the road is dug up it is normally mended so the repair is flat, but after a couple of years it normally turns into a dent. This is because the stones that were used to fill the hole are vibrated slightly by traffic going over the top. This means that they pack together better, take up less space and create a dent. Ever Seen an Elephant Run?